Hindoo Excavations in the Mountain of Ellora near Aurangabad,' engraved by Thomas Daniell after the drawings of his deceased friend James Wales, which Daniell regarded as the sixth set of his 'Oriental Scenery.' 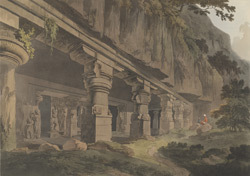 This cave at Ellora in the Hindu sequence shows part-fluted columns of the type found in Elephanta, with tall square bases and squashed cushion capitals, and is similarly datable to the 6th century. Two guardian figures or dwarapalas are sculpted on the sides of the entrance.